Be a Junior Animator! 8 Week Course Announced for 2018! 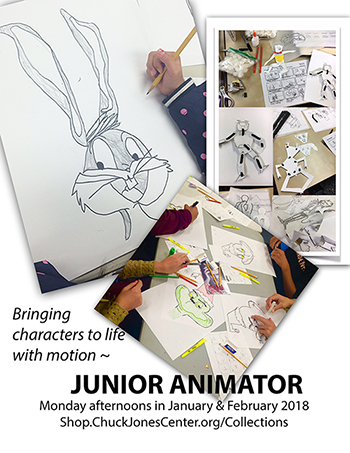 The Chuck jones Center for Creativity is excited to offer "Junior Animator--Bringing Characters to Life with Motion!" at their Costa Mesa classroom this January and February 2018. This after-school class will meet from 3:30 PM to 5 PM every Monday in January and February 2018 beginning with January 8. Led by one of the Center's remarkable and experienced teaching artists, "Junior Animator" will be a hands-on learning experience for students ages 7 to 14. Space is limited to just 12 students, so sign up by clicking HERE today! The full 8-week program is only $120 ($15 per class) or $17 per individual class when you pre-;pay. Drop-in fee is $20 per class if space allows. An excellent stock-stuffer for that hard-to-buy-for animation artist in your family. Click HERE to reserve their space at "Junior Animator"!